Time to cook seems to be the most sought after ingredient in most people's pantry. I balance the daily grind (yes, there is one, even at Camont!) by cooking once for twice- or at least making enough food for two meals from one recipe. Mostly I like having good food on hand ready to be transformed into a hot comforting 'instant' dish on my table. 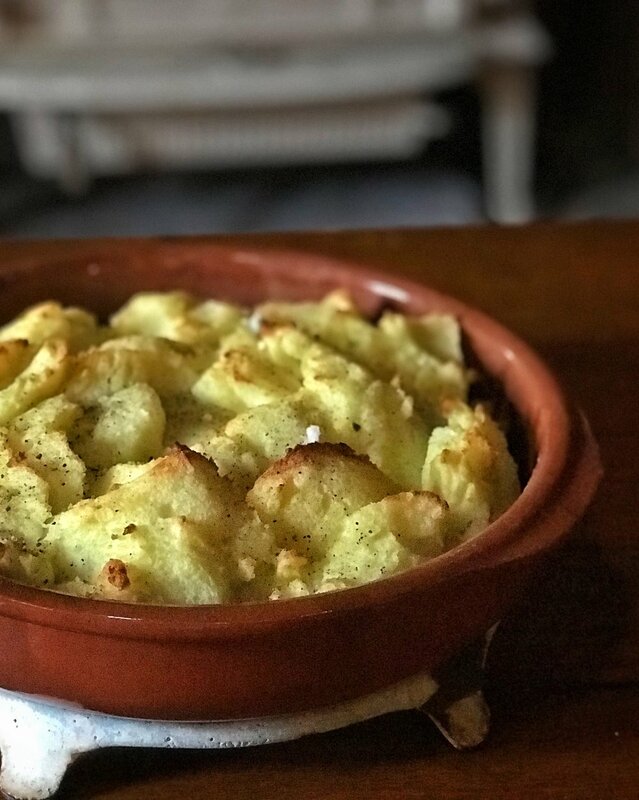 Thus the Parmentier de Canard becomes a staple lunch or supper dish here when friends arrive. After writing about my own ducky experiences this month- 'A Flock of One's Own' for Saveur Magazine, I wanted to explore some other great local duck-based recipes. You can start with leftovers like I did (from a braised duck and mashed potatoes) or cook a Parmentier with a jar of confit, and some quickly made pommes de terre purée. Twenty minutes in prepping and another twenty-five in the oven and you still have time to make a salad. Pour a glass of wine. Sit down. Think of something you want to plant in the garden. All of this in the same time as it takes to watch a mediocre TV show on Netflix. Time 45 Minutes- I begin with putting the potatoes on to cook. While they are cooking, I prepare the duck and set aside. And then return to the potatoes, make the purée and assemble the dish. A handful of mushrooms, sliced thinly. Prepare the duck, by shredding or chopping the cooked meat. If you use confit de canard, make sure to adjust the season for the more salty meat. Melt the duck fat in a saute pan and add onions or shallots. Saute until they are soft. Add the meat and heat thoroughly and until the skin is slightly crispy. Add the pan juices and water and bring to a hard simmer, just starting to bubble. Mix the flour and butter together to make a beurre manié. Add half of the beurre manie to the bubbling pan and stir it until the sauce starts to thicken. Add more beurre manié if necessary. Next prepare the potatoes by cooking peeled cubed potatoes in salted water, add the bay leaves and onion. When cooked thoroughly (not just for texture but for taste) drain, remove bay leaves and onion. Break up the potatoes with a fork adding milk and butter, and mix. You can make as smooth as you like or leave the fork-smashed chunks. Season with salt, pepper and nutmeg to taste. Assemble in an ovenproof gratin pan. Butter the gratin pan or use duck fat and arrange the mushroom slices on the bottom. Place the duck and sauce on top of the mushrooms and then spoon the potato puree over the top. I made quenelles (an egg-shaped spoonful made with two tablespoons) but you can make an even layer and rough up the surface with a fork. generously sprinkle with coarse salt and pepper. Bake in a hot oven 200’C/ 400’F for 25’ min until golden brown on the surface. Serve warm with a green salad or other cooked garlicky greens. This autumn week is always abundantly oversaturated with food, friends, family, fetes… It’s like the new year really begins here-one very busy year ending and one yet to be born arriving. Beautiful food haunts the fleeting Insta-photograph feeds as millions of my fellow Americans set tables, arrange flowers and autumn leaves, bake endless pies to the moon, and sit down to eat together, at last. It happens once a year near my birthday (but never on it) and the hoopla and feasting is a joyous thing to witness. I just wished it was more often. Really. More a normal thing for all these folks. Maybe not a ‘too much to eat’ dinner, but a ‘let’s share some food once a week or once a month’ sort of thing. Could we start a new movement? I don’t mean to preach. At least, not too much. The life I chose to make here in France has been one continuous long feast. But like many, I, too, need an occasional reminder and social media heads-up to be grateful. A special day to say ‘Merci’ for all the blessings of friends and family, plenty and diversity, and all the small comings and goings of a gastronomic life. I always said Thanksgiving was my favorite holiday: the extra efforts, the long-distance travel to table, the gathering of the clans. Now, I think I’d swap it for the weekly suppers with French neighbors and friends, the monthly ex-pat Spicy Cravings Club Potlucks, and the occasional lunches out in a charming village cafe with girlfriends. We all need reminding more often. We all need gratitude and cooking on a daily basis. 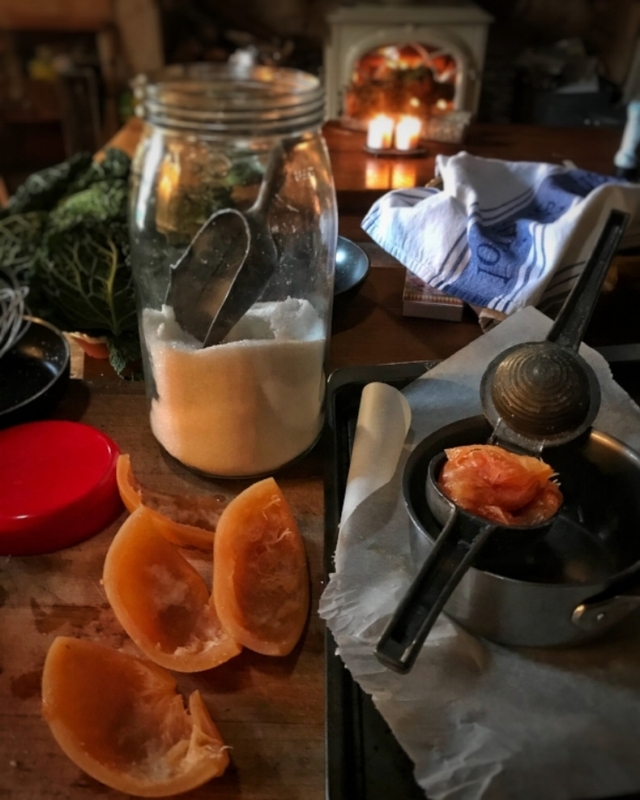 I hope I can inspire some of you here, cajole a bit or just give you a solid recipe to try out. Shopping would be where I start. Always. Look at this old postcard. 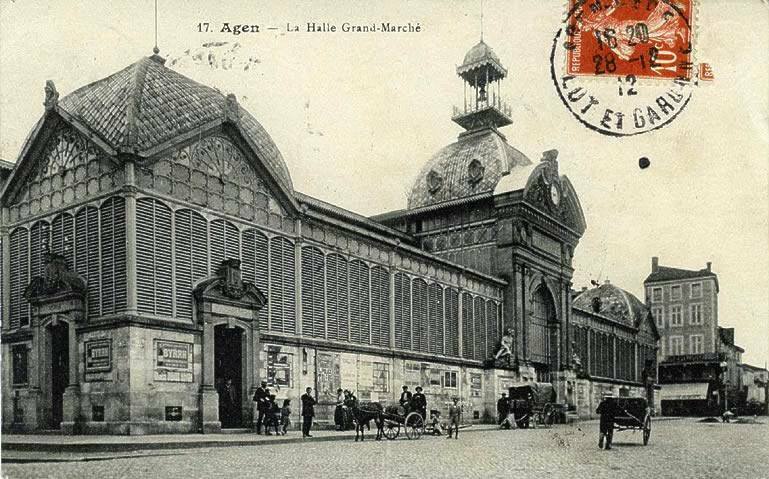 The photograph is of the original Marche Couverte in Agen, the covered market hall. What a nostalgic reminder of when beauty and food were a daily occurrence! Inseparable. Concrete evidence that food (and thus cooking and eating) was valued so highly that a glass and iron temple was erected to its honor. It doesn’t look like that now. Demolished in 1970 by the army of young revolutionaries looking to upgrade and modernize France, a modern concrete parking structure squats over a truncated market hall with barely two dozen vendors. When built in 1884, there were 184 stalls selling locally produced food. So why do I still shop there? To touch the past; to buy the best beef and imported charcuterie from the Pineau Freres; to celebrate the oyster season at Poisonnerie Gibaux and find foie gras and a rare truffle or two at Chez Maria; to share a glass at Gueuleton’s wine bar; to support the experienced butchers, charcuteries, cheese and fishmongers; and especially to keep the future market options varied and abundant. So your first task- support your local, farmer, producer, CSA, or whatever food is actually bought from a real person. Keep your food money close to home. Encourage your raw milk neighbors to keep those few cows freshened. Buy small batch cheese. Bring home warm bread from the bakery. Each small thing that you do that touches another is a reward in itself. This week I bought the following at the weekend fete and market: fresh grape juice and grapes, hazelnut flour and oil, walnuts and their oil, spelt bread, prunes, cheese, chicken, carrots, apples, eggs. I'll be making some holiday treats with these and sharing those recipes here.